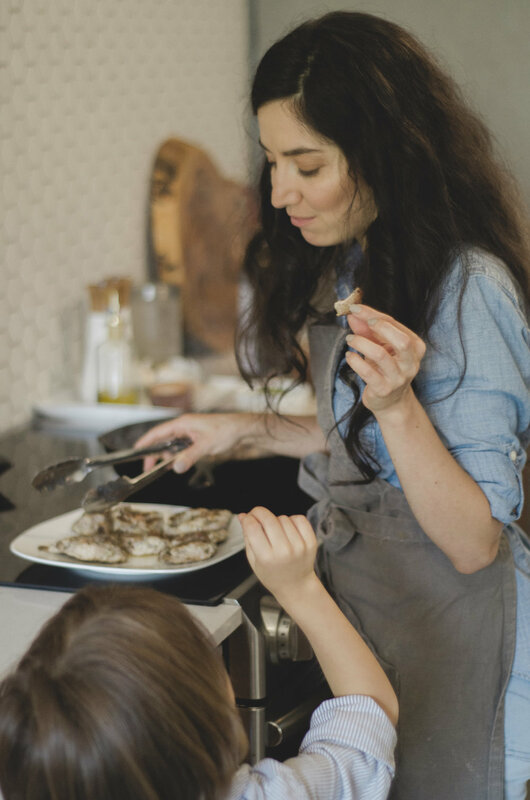 The most common question I am asked is a toss up between “How do you get your kids to eat so healthy?” and “How do you feed your crew on the regular?” There have been seasons when it has been a full-time job, but honestly, it isn’t the chore some might imagine for three reasons. Though I love creativity in the kitchen, my weekly prerogative is to be well nourished rather than innovative. We have established the practice of meal prep priority, and the learning curve is now a past life. I’ve taught my children how to make waves in the kitchen. These kids can cook, and I let them! This is partially why they are so willing to eat healthy, but that elaboration is another post for another day. In truth, they are thinking about food in a way that I did not establish until I was well into young adult life. It was with this thought in mind, as I ate a delicious simple healthy meal provided by my ten year old son, I realized the foundational significance of how we think on food. It gives us the ability to sustainably prep, cook, and sit down to healthy home-cooked meals every day. Insert our printable HIVEhomemade 5 Step Meal Guide. 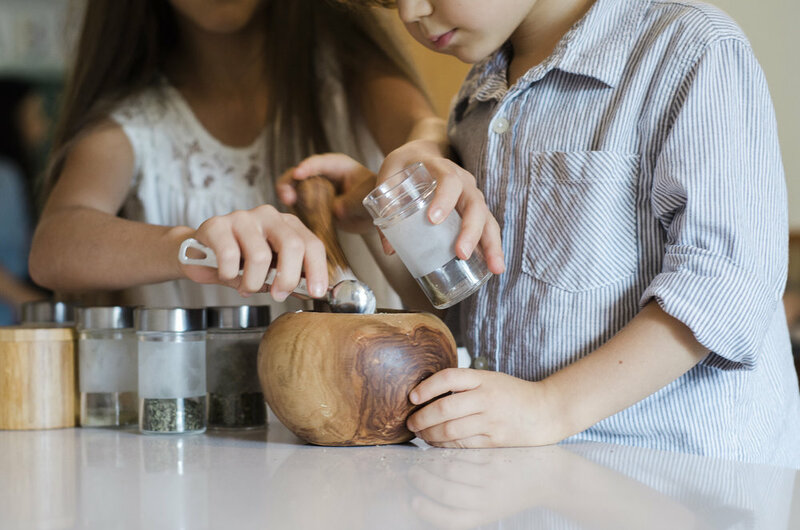 In short, this is how we think on, plan, and prepare food daily as a family of seven with ease, but it will aid for one, two, or fifty guests at the table as well. Let me break it down a bit though it is truly self-explanatory, and if you want to skip my commentary and go straight to printing our guide, you will navigate just fine. It’s that simple. Step ONE: Choose a Protein. Something I like to point out is not to ignore the ‘lesser’ cuts, organ meat, or the versatility of eggs. They are often the most budget-friendly, savory, and easiest ways to change things up a bit. Also, keep in mind that your meat may need to start the cooking process a bit before your veggies, or may even be your deciding choice on which veggies to partake. For example, fish with a broiling time of 7 minutes is more easily paired with asparagus and sliced yellow squash rather than potatoes unless using two cooking methods. Simply remember to think ahead and plan accordingly. A discerning palette knows that an oil has the influence to change a meal, but when in doubt just pick one, because the meal will not suffer with any of our choices. You will develop your personal preferences over time. It’s simply important to use a healthy oil to pack in your essential omega 3’s, brain power, and sustenance for lasting, filling, and nourishing meals. Be aware of recommended cooking temperatures for the most benefits. STEP THREE: Choose preferred seasoning. This is the component that may need the most think-ahead prep. I like to create seasoning blends not only for the ease of meal prep but to keep them free of additives, fillers (for example, plastic & toxic ingredients - I wish I were kidding,) citric acid, and gluten. Thus, below you will find one of my favorite dried Green Herb blends for you to keep on hand as it is my most requested blend to date. I use it most often on poultry in all forms, but it is fitting for pork, red-meat, and choice seafood as well. STEP FOUR: Choose fresh fruits + vegetables. Remember, eat the rainbow and allow fresh fruits and vegetables (raw or cooked) to be the main event on your plate. I make sure we have no less than a two to one ratio of veggies to protein, but more often than not, we result with a 3:1 or even 4:1 ratio. I may not always include a fresh fruit choice reserving those options for snacks or paleo desserts. Also, do not hesitate to nix the meat fully and opt for a vegetarian dish! I simply recommend using an optimal amount of healthy oil to counteract post hunger pains. STEP FIVE: Choose a cooking method. Choosing between roasting, baking, slow-cooking, grilling, sautéing, or pressure cooking may seem daunting, but it shouldn't. Let your time and often cut of meat or protein do the choosing for you, and don't be afraid to experiment with grace for the learning curve. For example, if you have the convenience of prepping the morning of for the evening, the crock-pot is an option, but if you are utilizing frozen meat + veggies with 15 minutes to spare, the Instant Pot is your friend. Personally, roasting is most often my favorite fast method due to it’s ability to infuse another depth of flavor. However, since switching to cast iron this is now also true of the common sauté. Whichever you choose, commit, and don't be afraid to experiment. All this said, please let us know if you find this helpful or if you have any questions on how to navigate. So much is learned by simply forming the process of consistently cooking at home, and you may be surprised how "fast food" becomes more often a product from your personal kitchen than a drive-up window. 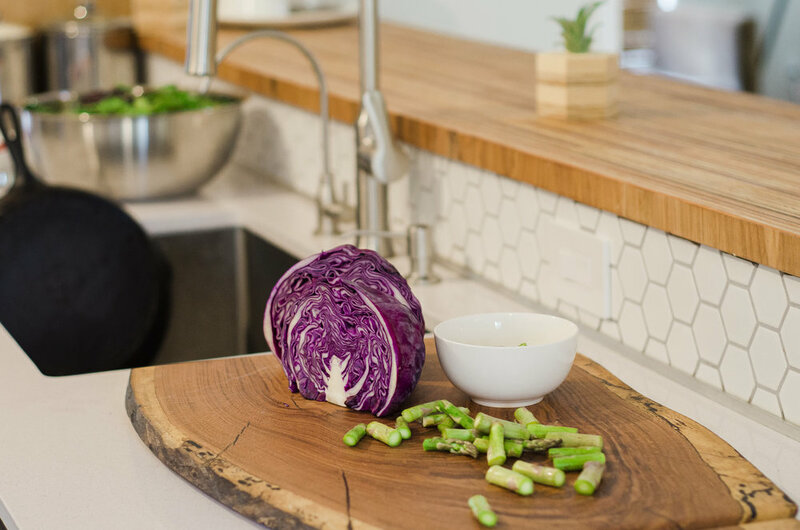 There's satisfaction in allowing your home-kitchen to be the hub of your wellness + nourishing habits, and the benefits far outweigh the learning curve for those that may need encouragement. Now, get cooking! Subscribe to our mailing list and we will send our FREE Paleo + Whole30 Meal Guide straight to your inbox! Stay up to date on our blog, product promotions, and exclusive discounts to HIVEhome Market. This one of my favorite dried Green Herb blends and is my most requested blend recipe to date. I use it most often on poultry in all forms, but it is fitting for pork, red-meat, and choice seafood as well. Grind all ingredients with a small blender attachment, mortar & pestal or mocahete to a cohesive consistency for optimal blending of flavors. Store in an airtight container. Share recipes or fast fixes using this guide on Instagram with hashtag #HIVEhomemade #fivestepmealguide and follow us on Instagram and join our HIVEhomemade Facebook page for healthy predominantly paleo/whole/30 recipes + foodie fun. Photos by HIVEhome team-member, Jessica Collins of Tribe Photography. 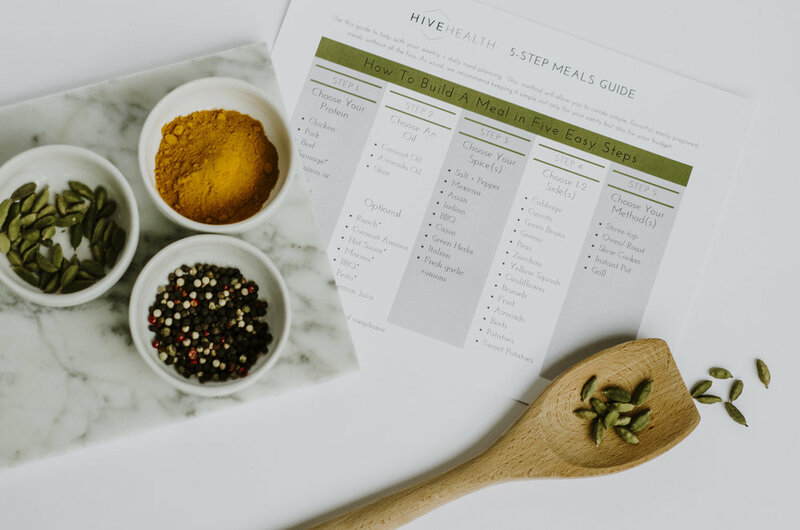 HIVEhomemade 5 Step Meal Guide by HIVEhome team-members, Andea Beims + Andrea Haney. HIVEhomemade Green Herb Seasoning by HIVEhome founder + curator Andea Beims. ENJOY THIS POST? PIN IT + SHARE IT!